1. Preheat the oven to 220°C, gas mark 7. Joint the chicken into 8 pieces. Place into a large roasting tin in a snug single layer with the olive oil, shallots and garlic. Season and toss well. Roast the chicken in the oven, skin-side up, for 15 minutes. 2. Reduce the temperature to 180°C, gas mark 4. Add the chorizo, wine and half the tarragon sprigs. Return to the oven and cook for a further 30-35 minutes until the chicken is thoroughly cooked, the juices run clear and there is no pink meat. 3. 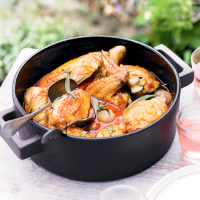 Remove the chicken, shallots and chorizo to a platter using a slotted spoon, cover and keep warm. 4. Place the tin with the juices and garlic over a high heat, pressing the garlic with a wooden spoon to mash the soft cloves. Simmer for 2-3 minutes, until slightly reduced, then add the lemon juice and cream and cook for 1 more minute. Strain through a sieve over the chicken. Scatter with the remaining tarragon leaves and serve immediately. Delicious with crusty bread or new potatoes and green salad.